Tonight, Viv and I needed a quick bite and needed some Chinese pastries; thus the decision to pay Crystal Mall a visit. We ended up getting some items from Wang's, which in my mind has some of the best Xiao Long Baos in time for cheap. 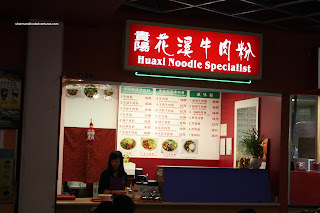 Seeing Kim's post on Huaxi Noodles, I went to try it for myself. 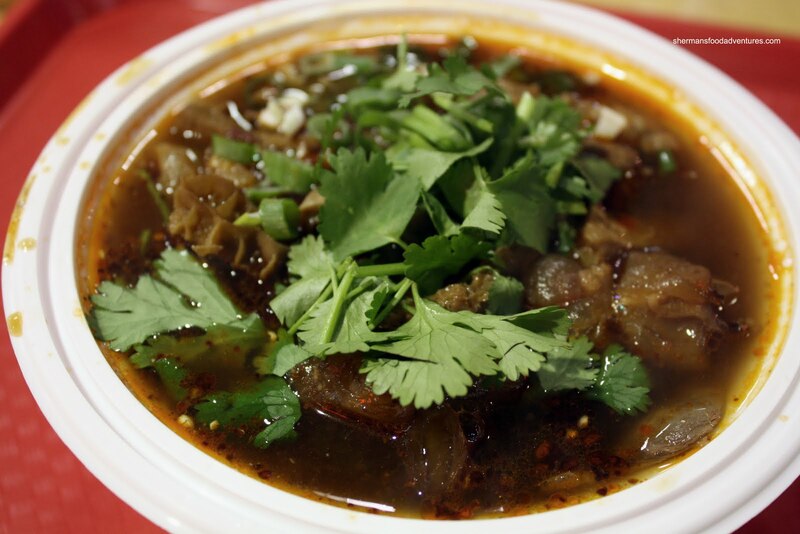 I ended going for the Beef and Tripe Noodles and I asked for them to make it as spicy as possible. She was a bit hesitant to do so; but I insisted I could handle it. Besi des, I made it out of the parking lot didn't I? What can possibly be worse? Well, she wasn't kidding. Viv stopped eating it altogether, not because it was too spicy per se; rather, it was really greasy from the copious amount of chili oil. I mean, it was still quite spicy; but we could handle it. 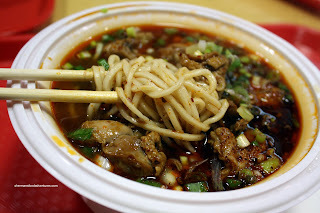 Getting past the oil, the beef noodle was quite good. The noodles were soft while still exhibiting some rebound. The beef was alright with the tripe being more on the chewy side. With all that chili oil, I couldn't really get a sense of the broth; yet it did have depth and good colour. 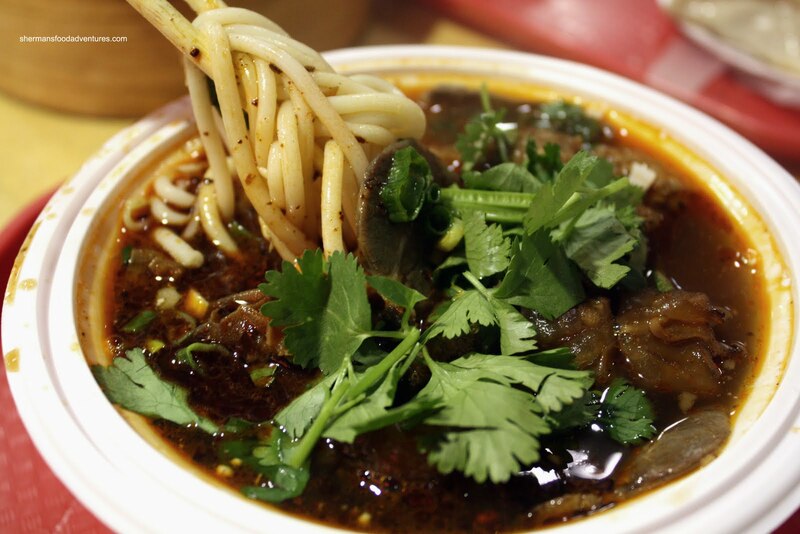 A good beef noodle; but not great. On a return visit (yah, tempting fate with the parking lot, I know), I decided to try the Guiyang Style Spicy Chicken Noodles. This time I decided to try it in medium, so I could get a better sense of the broth. The broth was still quite spicy and oily; but the soup was quite flavourful without being salty. This time around, the noodles were perfectly al dente and I enjoyed them very much. I wasn't a big fan of the chicken. Just too small and bony. Hard to eat in soup. Whatever the case, the noodles are solid here. Perfect for a cold, rainy day. "The horror of your circular parkade which affords me only one means of entrance and escape. The patience I must hone while watching a full-face masked Corolla driver take 10 minutes to get out of their parking spot. The zen-like meditation I must practice while almost being hit by drivers who do not realize that other people exist in the narrow ramps from P1 to P2. " ...or in the library across the street! I'm beginning to think you're a masochist, Sherman. I also asked them to make the soup as spicy as possible. Almost had to take the next day off from work! I used to quite like this place but then I discovered the taiwanese noodle place right across form it next to the xiao long bao place actually has better noodles for a bit more on the price...maybe personal preference. Kim, I have no choice but to park in that lot. When one has kids, walking across the street in the rain is not fun. So I must suffer! LR, I'm glad you agree! Karl, that soup is so darn spicy my stomach is on fire after! Thanks for the tip Ada!